In an effort to enhance the overall content of AzPA Pharmacy Flash, we’d like to include peer-written articles in future editions. 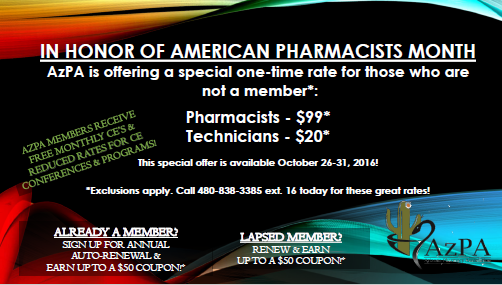 As a member of AzPA, your knowledge of the industry lends itself to unprecedented expertise. And we’re hoping you’ll share this expertise with your peers through well-written commentary. Because of the digital format, there’s no word limit, and our group of talented editors can help with final edits. If you’re interested in participating, please contact Ronnie Richard to discuss logistics.